Appearance: off-white to yellow brown powder or cream. Rosemary extracts are derived from Rosmarinus officinalis L. and contain several compounds which have been shown to exert antioxidative functions. These compounds belong mainly to the classes of phenolic acids, flavonoids, diterpenoids and triterpenes. The present opinion refers to rosemary extracts prepared using solvent extraction (ethanol, hexane, acetone and supercritical carbon dioxide techniques). 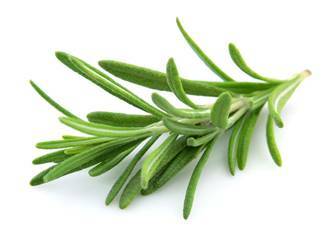 Dried leaves of rosemary contain between 1.5%-2.5% carnosic acid and only about 0.3%-0.4% carnosol. Carnosic acid is the starting element of a unique antioxidant mechanism called the “Carnosic Acid Cascade” (See below figure). 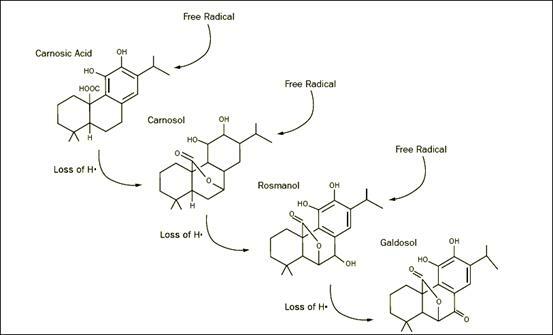 The cascade is an exceptional series of chemical reactions that involve the transformation of carnosic acid into carnosol; carnosol into rosmanol; and rosmanol into galdosol. With each of these transformations, free radicals are quenched. Dried leaves (500g) were extracted with ethanol at room temperature, and the ethanol was evaporated to dryness under reduced pressure. The dried extract then was mixed with 1L of n-hexane for 70h and filtered. 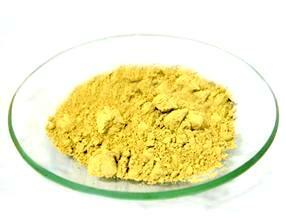 The extract was concentrated to one-third of its volume and extracted three ties with 0.5L of 5% NaHCO3 solution. The combined bicarbonate fractions were treated with H3PO4 to achieve PH 2.2. The acidic solution was then reextracted with n-hexane, dried over Na2SO4, and concentrated under reduced pressure until off-white crystals appeared. Evaporative recrystallization from n-heptane yielded off-white crystals of Carnosic acid with a melting point of 190℃ and purity greater than 95% as indicated by HPLC and NMR. HPLC-DAD-MS/MS analysis of the RE extract revealed that a total of 15 phenolic compounds were present in the extract distributed in three major categories: phenolic acids, diterpenes and flavonoids. 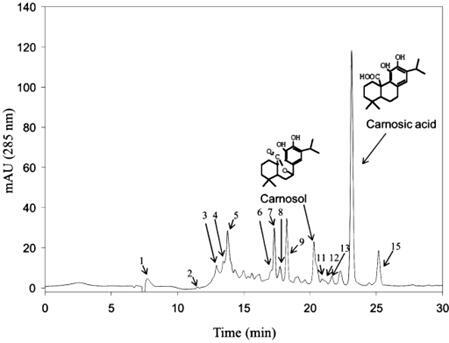 The structure and peak identification of carnosol (peak 10, content 6.5%) and Carnosic acid (peak 14, content 39%) are indicated. 1. Antioxidant, antisepticand antibacterial, its antioxidant ability is far higher than VC, VE and Teapolyphenols, and 2 to 4 time stronger than BHA and BHT. It is stable andendures high temperature of 190-240C. 2. Prevents senescence, eliminates free radicals. 4. Skincare - skinrestoring and moisturizing, eliminates freckles.